We received an email from Bruce a week ago to let us know that he has the 10th Edition of his book out and that it would be available soon. Older copies have been offered on Ebay for as much as $800.00, which we find totally ridiculous. If anyone is looking to purchase the new 10th Edition, you can get it here for $29.95. This will be his absolutely last update. Bruce's website can be found here. For more than twenty years Van Sant repeatedly surveyed nearly 200 anchorages between Florida and South America. He racked up well over 80,000 sea miles doing it, mostly single-handed. Why? You’ll find some interesting answers in his book of stories, Margarita Cat, but essentially, he did it because he liked doing it. Sailing up and down the chain of islands so much and so often, he got to looking for shorter and easier ways to navigate between each link in the chain, and he kept refining detailed nav plans for every leg. He has systematically taken the thorns out of the route they used to call the Thorny Path. For example, he exploits the calming effects on wind and sea which result from land cooling on each side of an inter-island passage. Applying his many methods, both sail and power can make safe, comfortable and pleasant progress even against normally impenetrable trade winds and seas. 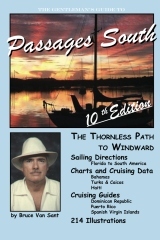 Passages South offers an illustrated manual of instruction for specific passages and harbors down islands as well as a cruising guide for the Greater Antilles islands of Hispaniola and Puerto Rico. It has sailed aboard tens of thousands of boats passaging between the Americas. It should sail with you too. About the Author During his 40 years of cruising the world, Van Sant worked as a consultant systems engineer as well as weriting and speaking in Asia, Europe, Latin America and the Middle East, picking up six languages along the way. He settled into cruising the myriad islands between Florida and South America. Read more about his adventures in his book MARGARITA CAT.